I wrote a few days ago about the Ford Mustang’s pitiful two-star Euro NCAP crash test score. That’s the lowest score awarded to a top 10 manufacturer since 2008. A 1997 Rover 100 and a 2017 Honda Jazz after a standard 40mph frontal impact test. I know which car I’d rather be in (source: Thatcham Research). After the 40mph head-on crash pictured above, the safety cell in the Honda Jazz was intact. The driver would probably have walked away. In the Rover 100, the bulkhead has collapsed and the driver’s seat has broken away. The driver would probably not be walking anywhere. Admittedly, even 20 years ago, the Rover 100 scored poorly for safety compared to most of its peers. But by modern standards the 100 was clearly a death trap. Ford’s apparent disregard for modern safety standards is distressing because it harks back to the days leading up to February 1997, when Euro NCAP safety tests were introduced. 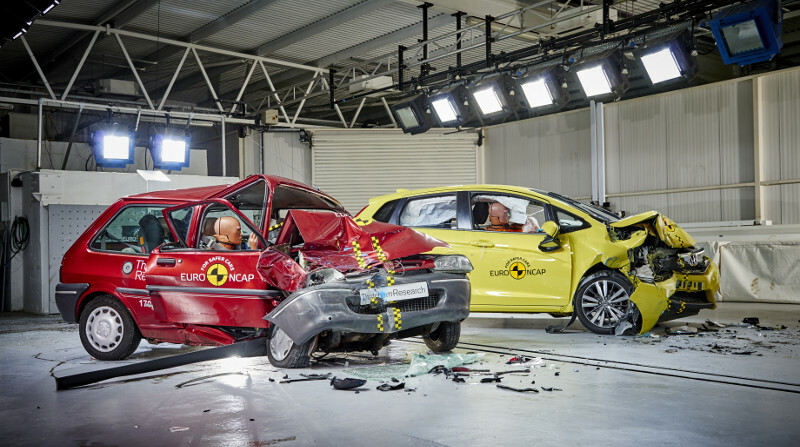 The new tests were launched“in the face of fierce motor industry opposition”, according to safety group Thatcham Research, which conducts Euro NCAP tests in the UK. Back then, car makers only had to meet basic legislative crash test requirements for new cars. They conducted their own crash tests in private and didn’t publish the results. There was no way for consumers to compare the safety of one car with another. Leading car manufacturers attacked the Euro NCAP tests, claiming they were so severe that it was ‘impossible’ to achieve four stars. But just five months later, Volvo’s S40 became the first four-star car for occupant protection. Manufacturers now compete to out-perform rivals in Euro NCAP tests – and regularly use the ratings in their advertisements. According to figures released by Thatcham to mark the 20th anniversary of Euro NCAP tests, 182,000 deaths and serious injuries have been avoided in the UK since 1997 thanks to the work of Euro NCAP. Deaths and injuries among car drivers and their passengers have fallen by 63% over the last 20 years, from 23,000 in 1997 to 8,500 in 2015. And that’s happened alongside steadily rising traffic levels. In 1997, many motorists were still choosing not to wear seatbelts. Only a few years later we were demanding airbags, side impact protection and other safety systems. You’re now twice as likely to walk away from a car cash compared with twenty years ago. Airbags, crumple zones, safety cells and electronic stability control (traction control) are now standard on the majority of new cars sold in Europe. They are pretty safe — drivers and passengers regularly walk away from major crashes. A focus on pedestrian safety — an area ignored in before Euro NCAP testing — has seen the number of pedestrians and cyclists killed or seriously injured has fallen by 40 per cent, from 14,500 in 1997 to 8,500 in 2015. But crashes are still happening. Our roads are more congested than ever and drivers inevitably make errors that lead to crashes. Figures released by the the government today show that there was a 6% increase in the number of deaths and serious injuries on UK roads during the year ending September 2016. Shockingly, there was a 22% increase in the number of children killed or seriously injured on UK roads last summer (July-September) compared to the same period in 2015. Euro NCAP’s focus is now on encouraging manufacturers to build cars with the ability to avoid crashes or reduce their impact. The test’s focus is shifting onto safety systems such as Autonomous Emergency Braking (AEB), Lane Assist and cyclist protection. Thatcham Research believes that if AEB becomes standard on every new car sold in the UK, then pedestrian and cyclist deaths could fall by 2,700 each year. New Euro NCAP tests planned for 2018 include Lane Assist systems that control steering when needed, tests to reduce junction crashes and more advanced AEB tests, focusing on areas such as night time pedestrian and cyclist safety. The future looks safer and it seems clear to me that Euro NCAP’s testing will also play a vital role in the gradual transition to self-driving cars. ← PCP versus leasing: which should you choose? The increase of children injured or killed on the road does not surprise me. I’ve lost count of the number of times I’ve seen both adults and children just crossing without looking both ways, or too preoccupied with their smartphone to bother looking up, let alone left and right. The art of crossing the road has clearly been lost.